Instructions: to hide the 'Footer Content' below do not delete it, rather highlight the text and italicize it to hide it from view. We empower our students to be authentic and prepare them to lead by demonstrating knowledge of and respect for the rich variety of people and points of view that exist in our complex global society. We remember Gloria H. Snyder who died on December 21, 2018, and was one of Parish’s first bold leaders. She served as Head of School from 1980-2009. Her legacy will always pulse throughout our community - through its programs, its students and its aspirations. Inspired by our values of Wisdom, Honor and Service, Parish Episcopal School's inclusive Episcopal community guides young people to become creative learners and bold leaders prepared to impact our complex global society. 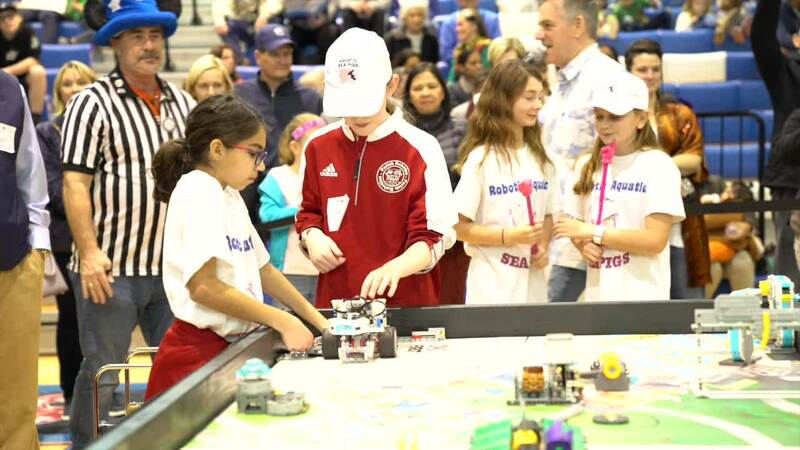 With more than 10K square feet of dedicated space for STEM, robotics and design-thinking, all students get a rich array of interactive labs, projects, enrichment classes and co-curricular opportunities. Curriculum woven throughout every grade, teaches every student that they are positioned to lead and that it’s more than titles, popularity and transcript-building... it’s about being a person of impact. An opportunity for Upper School students to direct their passion for global issues into generating meaningful solutions for the challenges facing the world. Learning opportunities in a blended setting – online and face-to-face – challenge students through vigorous coursework in a wide range of content areas. PARISHarts empowers students to create, perform and respond with knowledge, skill and confidence. We strive to advance each student's (PreK – 12th grade) academic, artistic and social skills so they become independent and creative young adults with a lifelong interest in the arts. Through a foundation of key practices/assessments, Parish graduates are able to think Critically, Communicate effectively, Collaborate purposefully and Create meaningfully – enduring skills to have in the rapidly changing world they will lead. This multi-faceted program includes during and after school components designed to allow students to optimize and maximize the Parish learning experience. It includes ParishLab, ParishLink, ParishEXTEND (after school programming), Parish Summer camps, ParishAbroad, ParishVirtual (online classes) and ParishDrives (driving school). Parish Athletics is designed to build future leaders with an emphasis on excellence. The program includes 60 plus teams in 22 sports, opportunities across all grades,and specialty programming such as sports medicine and Leadership Captain's Program. Middle and Upper School education programs that seek to raise the global competency of Parish students through purposeful and meaningful travel – leadership and service trips, cultural trips and linguistic immersion trips. Tennis Girls Doubles become back to back State Champions! Track and field team competes at TAPPS District Meet and qualifies several athletes for regionals, Boys' and Girls' Lacrosse continue their district play and Boys' Golf plays well in their match. Check out these sports highlights! Senior Emily Nielson finds her voice on the page and in the classroom at Parish. Hear more about her story in this My Parish Moment. Golf competes in TAPPS District Tournament, boys' lacrosse celebrates their senior night with a win, girls' lacrosse posts a big district win, softball racks up hits and runs, and tennis plays tune up matches before the State Championship. Check out these sports highlights!